Last year, California’s solar industry celebrated its win on preserving net metering. 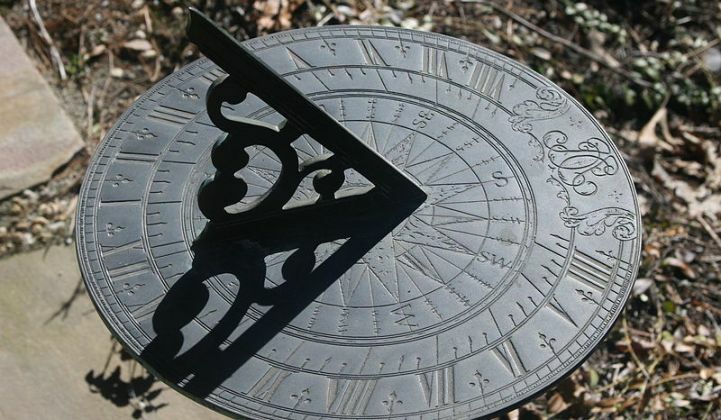 This year, it gets hit by the other side of the equation: time-of-use rates. Over the coming months, California’s big three utilities will be filing general rate cases that shift the hourly schedule of on-peak and off-peak hours -- and the widely varying retail prices per kilowatt-hour that go with them -- into much later in the day. The resulting drop in the value of net-metered, on-site solar for future solar projects will be considerable, according to solar industry analyses. It could amount to 15 percent to 20 percent for San Diego residential systems, or 20 percent to 40 percent for schools or public agencies looking to go solar in Pacific Gas & Electric territory. Longer-term forecasting is a complex undertaking. The actual per-kilowatt-hour prices for these new hourly structures haven’t yet been set. All of that is going to be decided in the general rate cases (GRCs) rolling out over the coming year. San Diego Gas & Electric already has its GRC underway and is set to close it in the third quarter, and PG&E is set to close by the end of the year. Southern California Edison will close its rate-design case by the end of 2017, but doesn’t conclude its GRC until 2018. That puts solar industry players and their customers in a tricky situation, because many of them are facing the switch to new time-of-use regimes this year, even before the rates have been set. Commercial and industrial (C&I) customers are facing a July 2017 deadline for getting new solar projects interconnected under the old, grandfathered time-of-use (TOU) rates, for example. And residential solar customers will start moving onto TOU as they enter each utility’s “NEM 2.0” rate structure -- the extension of California’s retail-rate net metering ordered by the CPUC last year. For PG&E, the switch to NEM 2.0 already happened in December, SDG&E has hit its cap as well, and SCE is expected to shift into the new regime sometime this year. Last month, the California Public Utilities Commission issued a decision (PDF) that will guide how these GRCs end up influencing the value of solar, energy efficiency, and technologies like demand response and energy storage, as they implement TOU schedules to meet the state’s later-in-the-day energy needs. For the solar industry, the CPUC’s decision was a mixed bag. 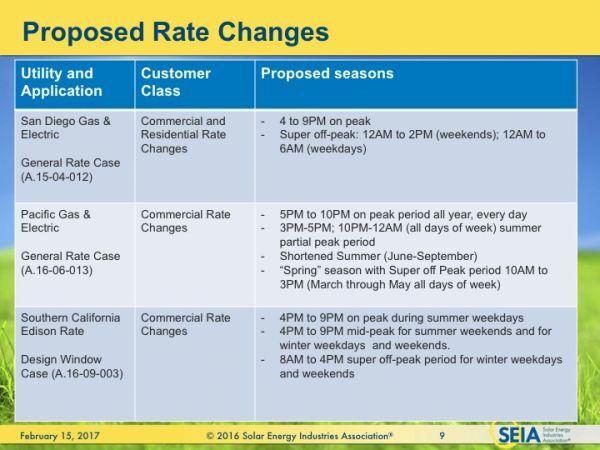 On the downside, it will allow utilities to move ahead with shifting the value of TOU retail rates pretty drastically -- from noon to 6 p.m. for most customers today, to as late as 4 p.m. to 9 p.m. for SCE and SDG&E, and 5 p.m. to 10 p.m. for PG&E. Here's a graph from a presentation from the Solar Energy Industries Association (SEIA), as part of its work to gain solar-friendly policies in the TOU proceeding. That decision came despite opposition from groups like the California Solar Energy industries Association (CALSEIA), which sought to limit the time shift to something less extreme, such as from 2 p.m. to 7 p.m., to retain more solar value. In testimony submitted as part of SDG&E’s TOU proposal, CALSEIA member Kevin Weinberg, commercial sales manager for Baker Electric, noted that commercial customers could see a 9 percent to 22 percent reduction in bill savings from solar systems under the new hourly structures. That reduction “could put a lot of customers underwater with their power-purchase agreements, leases, loans and property-assessed clean energy assessments,” he wrote. To soften the blow, the CPUC has offered grandfathering clauses, allowing existing solar customers the option to remain on their existing TOU rates for up to five years for residential systems and 10 years for commercial, industrial and institutional systems. That will help retain the economic output of systems designed with today’s rates in mind. The industry didn’t get everything it wanted from these grandfathering conditions, however. The CPUC’s ruling set a July 2017 deadline for interconnecting non-residential projects, for example -- a schedule that might be hard to meet for some projects already in progress, said Tom Williard of Sage Renewables. And there’s certainly a rush to get in under the deadline, because PG&E’s proposed commercial TOU rates are “really detrimental for solar customers,” he said. Using data from existing clients like commercial sites and school districts, and the preliminary rates and hours the utility has put forward, Sage has calculated that “you’re going to lose 20 percent to 40 percent of the value of the energy produced by your solar system,” he said. That’s due to the combination of PG&E’s later on-peak hours, and its plan to flatten the difference between on-peak and off-peak rates, from roughly 40 cents per kilowatt-hour difference today, to only about 15 cents per kilowatt-hour in the future. At the same time, the CPUC’s guidance also offers hope that California’s utilities will offer some outside-of-the-box options for solar-friendly TOU. This represents an important win for distributed energy resources like solar, demand response and behind-the-meter batteries, because it takes their local capacity value into account, Williard noted. California ISO, the state’s grid operator, does face a big shift in its peak demand from midday to late afternoon and early evening, as we’ve noted in coverage of CAISO’s duck curve demand-supply balance. But that’s mostly driven by utility scale solar, not rooftop solar. In some parts of the distribution grid, local solar could actually be providing marginal benefits -- and the CPUC’s decision is asking utilities to figure out what those are. 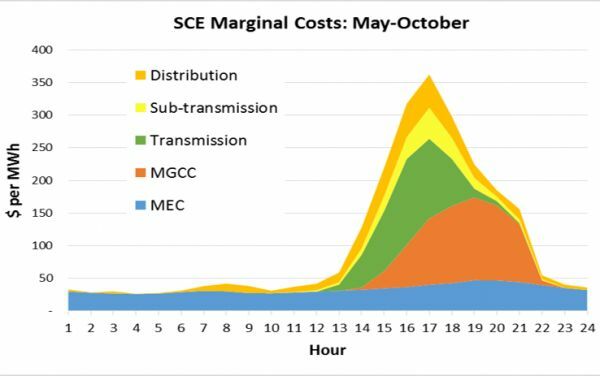 Here's another graph from SEIA that breaks out the marginal costs of Southern California Edison, for example, with distribution costs at the top of the peak. Secondly, the CPUC’s decision says that “each IOU should take steps to minimize the impact of TOU peak period changes on customers who have invested in on-site renewable generation or technology to conserve energy during peak periods.” Those could include additional steps to increase certainty such as legacy TOU periods, or fixed indifference payments, as well as other rate structures that provide predetermined limits on TOU period changes, it wrote. For Jamie Fine, senior economist with the Environmental Defense Fund, these indicate opportunities to try innovative approaches, like optional tariffs for solar customers who are willing to invest in storage or demand response to take advantage of extra-high differences between peak and off-peak prices that wouldn’t be palatable to most regular customers. SDG&E has proposed something along these lines, in the form of a tariff for battery-backed solar, with much steeper differentials between on-peak and off-peak hours. PG&E has also proposed a similar plan, although CALSEIA’s Heavner noted that his group sees some problems with the utility’s approach. In its SDG&E testimony, CALSEIA noted that it would take a 33-cent differential between peak and off-peak costs to make storage work, which no utility is contemplating for its mass-market residential TOU rates at present. EDF has also suggested that utilities should offer TOU customers online access to their energy use data to share with companies like rooftop solar installers and demand response providers. This may become an issue of contention in the TOU pilot projects that utilities are planning to launch in spring of 2018, in advance of the mass-market rollout of default TOU rates in 2019. Join us on March 8-9 in San Francisco for our California’s Distributed Energy Future (CDEF) conference, where Greentech Media and More Than Smart will be hosting a series of in-depth discussions with key policymakers and industry shapers on subjects like these that are critical to the state's distributed solar market.